Meeting held on September 13 within China-ASEAN Expo. More than 200 Vietnamese enterprises sought cooperative opportunities with Chinese enterprises at the Vietnam Procurement Meeting on September 13 at the China-ASEAN Expo (CAEXPO) in Nanning, China. The VIETRADE cooperated with the CAEXPO Secretariat and related agencies to organize the Meeting. 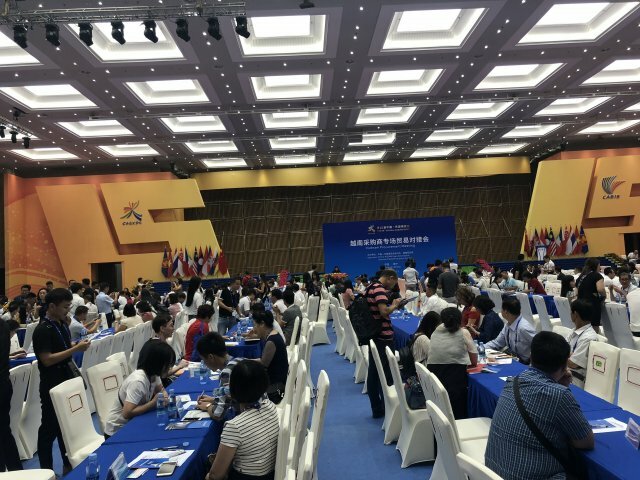 More than 500 delegates were in attendance - over 200 from Vietnam and 350 from China. Presenting his opening remarks, Mr. Le Hoang Tai, Deputy Director General of Vietrade, said Vietnam and China have a complementary economic structure and advantages in geographical proximity. “Total trade turnover between the two countries continues to be stable,” he noted. He also confirmed that two-way trade between Vietnam and Guangxi, of which Nanning is the capital, in the first seven months of this year reached $18.4 billion, up 22.2 per cent over the same period last year, and this emphasizes the strategic role and importance of Guangxi in trade cooperation between Vietnam and China. Ms. Xiao Xiao, Assistant of the CAEXPO Secretary General, said she firmly believes there are great opportunities for both Vietnam and China to seek long-term cooperation. Mr. Hoang Hong Tien, CEO of the Bazan Company, which is involved in the cashew business, said this is the first time he has attended CAEXPO and he expects to export his company’s products to the country via distributors, given the size of the market. Vietnamese enterprises attending the Vietnam Procurement Meeting come from fields with competitive potential in the Chinese market, such as agricultural products, foodstuffs, handicrafts, agricultural machinery, and others.